Dye penetration test is a type of non-destructive testing. It is also known as liquid penetration test It is a widely used method to detect the defects, cracks or flaws on the surface of a material. A wide range of materials can be tested with the penetration test. The principle of Dye penetration test is simple. When a less viscous liquid is applied on the surface of a material the liquid will penetrate into the surface cracks by the capillary action. Before these three steps, one vital step i. e. 'Precleaning' should be done. In this step, the workspace man is cleaned. all the dust, oil, grease particle must be removed. the impurities on the surface of the work-piece can lead to false results or false indication in the test. In the precleaning, many methods are used. For Example, to remove the dust or metal chips air pressure is applied to the surface. Some more methods like solvents, Degreasing etc. are used to remove other impurities such as oil grease etc. The motive of this step is to make the surface such that the defects are open to the surface and prevent false indications as a result of the test. After the precleaning first liquid agent i. e. The cleaner is used. The first liquid used face cleaner. The purpose of using cleaner is to make the surface free for your it is where the test is to be performed at Pune will be applied and kept for some time. the cleaner will disintegrate the remaining dirt, dust, oil from the surface. The penetrant is a dye which is very bright and colorful. After the cleaning is done and cleaner evaporates, the penetrating dye is applied on the surface of the specimen the dye should have low viscosity and low surface tension so that the dye can penetrate in the cracks easily. The smaller cracks will take more time to penetrate than the bigger surface cracks. The access dye on the surface has to be removed. This is also a very important step. The developer is applied on the surface where the penetrant was applied previously. The developer will have the capability to absorb the penetrant from the cracks. When the developer will absorb the penetrating agent from the cracks it will come out to the surface and the cracks indication will occur on the surface. 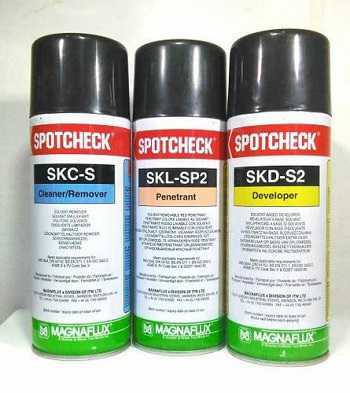 the Developer can be in the form of liquid or in the form of powder it depends on the type of penetrant used. Powder manufacturing is a production method for manufacturing different products or articles. In this manufacturing method, powdered metal is used. this Powdered metal is placed in a shaping mold and then compressive loads are applied to make the material settle down permanently. The process of powder manufacturing involves the manufacture of metal powder, blending, compacting, sintering. After that other finishing operation like grinding machining can be performed on the product. The heat treatment can be performed on the product to provide some strength to it.the heat treatment makes the particles of the metal powder to bind with each other. Powder metallurgy process is preferred for higher mass production because this makes it economical. 2. blending of metallic Powder to get it'is required form. 4. Sintering of the compacted material in an appropriate atmosphere. 5. heat treatment in the material if required any. 6. final finishing processes if required. Sintering in the powder metallurgy is done when the metal powder is compressed or compacted. in the compacted material the temperature is raised. but it is kept below the melting point of that material. The workpiece is to be kept in the controlled atmosphere up to an appropriate time. Sintering provides strength to the final product. Cam and Follower Mechanism is a widely used method of motion transformation. Cam follower is also known as 'Track Follower'. Cam is a rotating element Which provides an oscillation or reciprocatory motion to another part connected with the cam. Another part associated with the cam is called 'follower'. The cam rotates about an axis and the follower is attached to it with a point contact. Basically, the cam and the follower makes a higher pair together. To make a set of cam and follower first we need to determine the required motion of the follower. When we know the path of the follower, then the shape of the cam will be designed. The design g the cam would be based on the length of the path which follower has to proceed and also to the speed of the movement. The rotation of the cam would be at uniform speed. The cam and follower mechanism are widely used in automobile industry. For example, inlet and the outlet port of i.c. engines, feed mechanism in the lathe machine etc are the mechanism of cam and follower. This mechanism is very important in modern day engineering to incorporate a system with controlled movement. 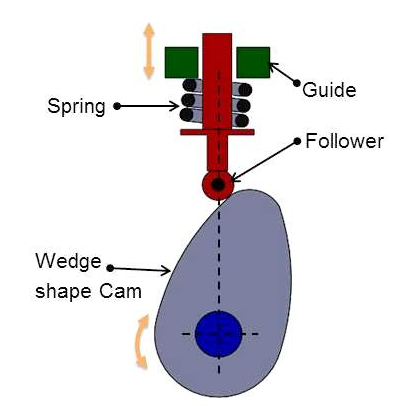 the types of cams are generally based on their shapes. It is an accurate design mechanism with a higher standard method of motion transformation. the elements used in the mechanism are usually durable and long lasting. Load Carrying capacity of cam and follower is excellent. Cam and follower mechanism mostly used in the Automobile vehicles. The inlet and the exhaust valve is controlled by cam and follower in the I.C. engine. In the textile industries, this mechanism is used for weaving purpose. In the automatic lathe machine, It is used in the feed mechanism. This is a short description of cam and follower. The cam follower Mechanism is a broad topic because of its wide area of applications. Zeroth law of thermodynamics mainly deals with one of the most important properties of thermodynamic system i.e. temperature. Temperature is a property which denotes the degree of hotness or coldness of a system or any matter. Here we are talking about temperature so it is clear that zeroth law of thermodynamics is a law of temperature. After the recognition of temperature as a property, the measurement of this property is required. Temperature is not an actual parameter, that is why temperature cannot be measured as its actual value so there are some standards made to define and measure this property. There are some more fixed temperatures like this referring to which the temperature scales were developed. Zeroth law of thermodynamics states." 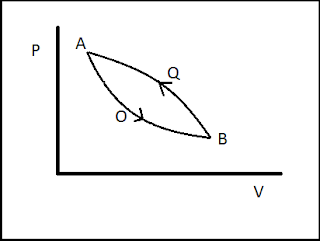 When two bodies A and B are separately in thermal equilibrium with another body C, then these two bodies A and B will also be in thermal equilibrium." The block diagram above shows that the Body A is in equilibrium with body C and body B is also in equilibrium with body C. this will make both A and B in equilibrium. 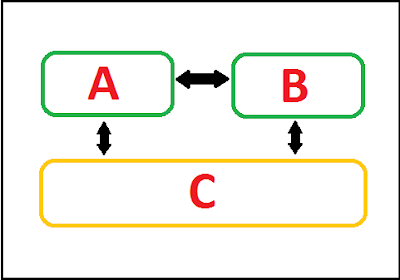 Equilibrium is shown by arrows in the block diagram. Zeroth law pays a vital role in the temperature measurement and analysis of thermal equilibrium. Various types of Thermometer is developed with the principle of temperature measurement. Zeroth law of thermodynamics was discovered after the first and second law of thermodynamics. But the law should be placed before the first and second law, that is why it was named Zeroth law of thermodynamics. When a thermodynamic process occurs the change of state will happen. the process will Change from initial state to final state. the change in state in the process occurs in two ways. Here, the thermodynamic properties will undergo some changes to change the state or to complete the process. there are two ways of the thermodynamic process and these are the reversible or irreversible process. A reversible process is a thermodynamic process which is capable of attaining its initial state by following the same path by which the process reaches to final state of the process from its initial state to complete the process. 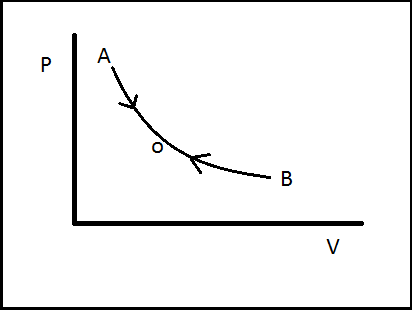 As shown in the graph the initial state of the system is A. when the thermodynamic process changes its state from A to B to complete the process the system will follow the path A-O-B. If the process is reversible then it will have the capability to get its initial state by following the same path B-O-A. this is called reversibility of a thermodynamic process. The reversible process is not a practical phenomenon because there is always some deviations in the process So it is a theoretical consideration. 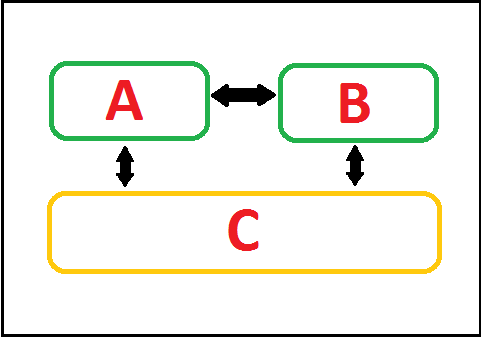 Quasi-Static process is an example of reversible process, but one thing should be kept in mind that Quasi-static process is itself an assumption. To understand the reversible process and thermodynamics equilibrium quasi static process it is analyzed. Irreversible process is different from a reversible process. The system will be able to regain its initial state after a process but it has to take a different path than the process is completed previously. In the graph, an Irreversible process shown. In the system When the state is changed from state A to state B the process is completed. To complete this process the path which is taken is A-O-B. When the system will try to attain its initial state A, it has to follow a different path A-Q-B. this makes this process an Irreversible process and This is called irreversibility of a process. There is a lot depends on the properties of the system because thermodynamic properties of the system decide reversibility and irreversibility of the thermodynamic process. This is a short description of the reversible process and irreversible process. Thermodynamic analysis largely depends on these phenomena. Quasi Static Process or Quasi Equilibrium Process in Thermodynamics. when a system in which matter in enclosed, undergoes a thermodynamic process, the thermodynamic equilibrium will no longer remain in the system. Although, it is impossible to have a system in thermodynamic equilibrium when it undergoes a process but there is an assumption with some considerations in which a process can be occurred while maintaining system in thermodynamic equilibrium. This process is called Quasi Static process or Quasi Equilibrium Process. The words 'Quasi' literally means 'Almost' and "Quasi static" means 'Almost Static'. So the Quasi static process is one which is almost remains in a single state. This process shows very small or infinitesimal deviation from its original state. due to this negligible change of state the process is seems to be in thermodynamic equilibrium. 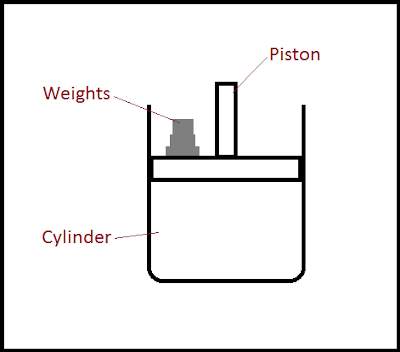 In the process a piston-cylinder setup is taken in which gas is filled inside it. when the heating of the cylinder or container is done the inside gas temperature will increase and the piston will be raised up. here the system will not be in equilibrium. 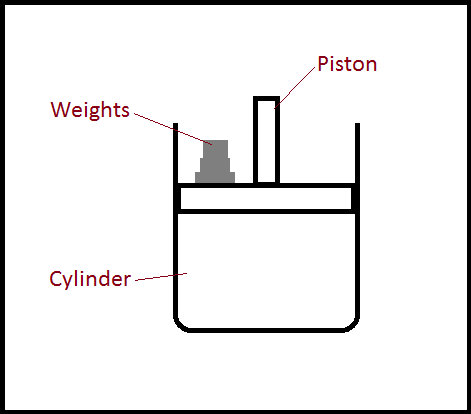 But if we put Some Weight on the piston such that the height at which piston is raised is covers back by this weight as the piston will go downward due to this weight. when we further heat the cylinder the piston will be raised again so we again put some more weight on it to compensate the raising of the piston. we will do it until the heat is added and we make sure the piston is at its initial position by putting appropriate amount of weight in it. This is a short description about Quasi static or quasi equilibrium process. it is an experimental assumption to show the thermodynamic equilibrium in a system. To maintain thermodynamic equilibrium in a system is a difficult thing. but in this experiment system remains closed to the equilibrium state.